Baby Snipers...Propaganda? Or are they just that evil? ..GENEVA - Snipers are targeting children in the besieged rebel-held Libyan city of Misrata, the U.N.' s children agency said Friday. Hundreds of residents have been killed and wounded in the assault by Gadhafi's forces on Libya's third-largest city, and residents are running short of water, food and medicine. "What we have are reliable and consistent reports of children being among the people targeted by snipers in Misrata," UNICEF spokeswoman Marixie Mercado told reporters in Geneva. The information was based on local sources, Mercado said. She was unable to say how many children have been wounded or killed in this way. The International Committee of the Red Cross said it is sending a team to Misrata by boat Friday and would investigate the reports of snipers targeting children. A spokesman for the Geneva-based aid group, Christian Cardon, told The Associated Press that children and other civilians not involved in hostilities are never a legitimate target in an armed conflict. "But without having any more information, we can't comment on what is happening there," he said. Now I can imagine that stray bullets killing kids could be reported as snipers shooting children, and in the current media climate there probably won't be many voices putting forward alternatives to the 'snipers' discourse. Then again, there are instances where belligerents do really horrible things. The Liberia hand-choppers, inter alia. So are the Libyan government forces just that evil? Or is this getting overblown? Following the casualty-reports from Libya, casualties have been relatively low. That indicates fighting has not been very intensive, which correlates with the rebels running from direct combat. It also indicates there haven't been any widespread civilian massacres. Therefore I don't buy this report, unless the rebels use children as couriers and such. When belligerents do horrible things in war, there's always some kind of rationale behind it - though it can be quite twisted. But I see no reason why anyone would specifically target innocent children unless they're massacring civilians in general, and the casualty figures indicate that's not happening. "We have every day about 30 to 35 casualties, dead, daily," he said. "And most of them are civilians — women and children, old people, sitting in their houses — and tanks have been shooting them in their houses." That's not such a bad casualty rate for street fighting, and definately not a massacre of civilians. Let's just say it's bad for your health to look out the window to see what's going on when troops are looking for and shooting at suspected enemy snipers. They'll shoot first, check your age and gender later. But children are notoriously curious. Last edited by egslim; 8th April 2011 at 12:18 PM. I dunno. Are they sniping the babies before or after they kick them out of the incubators? But I see no reason why anyone would specifically target innocent children unless they're massacring civilians in general, and the casualty figures indicate that's not happening. "This is what happens when your village/town harbors rebels." I have no way of judging the claim on merits, but the motive seems to be as old as warfare itself. Daffy has a lot of mercs on his payroll. They can well be that evil. Well played. I have seen already many, many, illogical tales of cartoonish evil attributed the Gaddafi regime. This one is a new classic. I like EG Slim's post better than my planned rant that for all we know, black-hearted provocateurs serving the rebel cause have been sniping babies, kids, whatever. But still, it's possible. And anything bad in Libya is automatically blamed on Gaddafi when even remotely possible. The world asks questions later, if ever. Consider the 130 Gaddafi soldiers/mercenaries killed "for refusing to shoot protesters." We have very good evidence the "protesters" executed this ten baker's dozens for something more like refusing to join them. And on the other hand, maybe this really is a government policy, or some rogue elements in his military or mercenaries, but probably the former, based on the "known" depraved madness of Muammar Gaddafi, who personally orders every atrocity his zombies willingly carry out. My first thought was also of babies with rifles. My second thought was that baby in the restaurant that just kept yowling and yowling, and it's parents wouldn't do anything to quiet it down. By the time dinner was over I was going to double up on by blood-pressure medicine. Surely it would be understandable if that baby were targeted by a sniper? Indeed. It's quite inappropriate to use a sniper rife at intra-restaurant range. Yeah I thought about that, but if you look closer at the information that's not going on here. You're right that massacring civilians is one of the oldest means of warfare, because it's very effective. Women, children and the elderly present a much easier target than fighting men, and taking out enough civilians destroys both the men's morale and supply base. It's how the Brits won the Boer's war, by locking up the civilians in concentration camps - where I think about 25% of them died - until the men simply gave up fighting. But I posted the casualty-figures for Misurata: "We have every day about 30 to 35 casualties, dead, daily," 30 to 35 dead daily is even fairly low for street-fighting. If they were targetting civilians to demoralize the enemy, the death count would be much higher. Foreign journalists are not authorized to go up the frontlines on the regime's side and reports of the fighting has been parcellar and confused at best since the beginning of the armed uprising, Misrata is not under control of the rebels, so that means we rely on local sources and secondhand information. There's lot of talk about "snipers" or isolated elements taking potshots, but I am not sure their identity has been proved in a convincing manner. I think we will only get tangible infos about the extent of the casualties once the dust settles. Doesn't this specific claim have been made recently about another occupying army (you know which one...)? Last edited by Laeke; 8th April 2011 at 11:19 PM. There is relatively little street fighting in Misrata as far as I can see. Government forces seem to be shelling the city from the outskirts inwards and advancing only on rare occasions. This is when fighting takes place. It's not a battle, it's a protracted siege. I would draw parallels with the Siege of Sarajevo, where Bosnian Serbs were able to hold the outskirts and shell the city, utilized snipers to terrorize the population, but never got the strength (and/or courage) to actually storm the city. Casulties were similarily "low" - some 10,000 civilians died, about 8 per day, plus about five times as many wounded. Something over 8000 soldiers died, on both sides. Sarajevo of the time (the city lost about 20-25% of population to emigration) and Misrata now are almost of equal size. The two situations appear to be very similar, with the only major difference being that the casulties in Misrata appear to be several times worse than in Sarajevo. This is probably because the siege is only in the beginning, where attacks are being pressed with more vigor. If the situation stabilizes, I would say Misrata will come out similar as Sarajevo. I would call that rather bad, no matter how "low" the casulties are. it's all but surrounded by Gadhafi's forces who are attacking it. This is house-to-house, street-to-street urban combat with a civilian population still inside the city. The same report remarks that: I think that's why they're pushing on Misurata so hard. They want to have control of every square inch of the west, to be able to say the west is under Gadhafi's control; it is loyal to Moammar Gadhafi, and I think that's where they're going with this now. Which makes sense. This isn't going to be a protracted siege like Sarajevo, Gadaffi wants to force a decision. Yes it does. But if it is true, we're only seeing the tip of the iceberg in casualties, which is rather unlikely. Some skirmishes do take place of course, but if there was major fighting between rebels and government forces we would, as you pointed out, see far more casualties. The casualty rate of about 30 dead a day among the defenders is consistent with occasional skirmishes, snipers and occasional altillery barrages. We do know that snipers and altillery (or tank) fire is being used against the city. The situation on the ground doesn't appear to match that assesment. A major offensive into the city, with the aim of conquering it in a short time, would push the casualties into thousands - both civilians and military - a day, but it would be over in a few days, since the rebels don't have the weaponry, tactics or training to withstand a direct assault. My guess is that Quackdaffis' forces simply aren't strong enough to both pacify his current holdings, keep up the fight around Brega and storm Misrata at the same time. In fact it's quite likely they're overstretched as it is. He would also need to either conduct a massacre on the scale not yet seen during this civil war or commit even more men to pacify Misrata. Instead, he is content by creeping up on the rebels, starve them out and kill as many as possible with weapons they are ill-equipped to handle. Remember who are fighting here. The Libyan rebels in the east of the country have demonstrated an almost incredible reluctance to risk casualties. They refuse to stand and fight. They flee when a few mortar rounds explode anywhere near them. They fire their own weapons from far out of range, to avoid getting close to the enemy. This behaviour is well-documented in the east. Similar reports indicate Gadaffi's forces are only slightly more standfast. If we assume rebels and loyalists in the west have the same fighting spirit and skill as their respective collegues in the east, there's no disagreement between the report of streetfighting and the casualtyrate. Neither side has the stomach for heavy, decisive fighting that would send casualties soaring. I think you vastly overestimate the difficulty Gadaffi faces when he has to pacify a formerly rebel-held town. The rebels display such an astounding lack of fighting spirit at the frontline, there's no way they're going to bravely rise up in a city dotted with checkpoints held by Gadaffi-loyalists. No massacre needed to cow them, and checkpoints can be held by untrained but loyal recruits. And loyalty is mainly a matter of tribe. Assuming you're correct, Misrata can be only described as a siege. You can't have a battle where neither side is remotely willing to face the opponent in battle. I think you vastly overestimate the difficulty Gadaffi faces when he has to pacify a formerly rebel-held town. The rebels display such an astounding lack of fighting spirit at the frontline, there's no way they're going to bravely rise up in a city dotted with checkpoints held by Gadaffi-loyalists. They don't have to. According to the information tricke from Tripoli, they are brave enough to fire at a policeman here and there and such. That would mean that a drawback of forces could quickly lead to a full blown rebellion. In addition, people tend to be braver if their only two chances are to die or to fight and hope for an eventual victory. That's why rebels in Misrata tend to fare better in combat than the ones in Brega. If it had been on the other side every UN and human rights organisation on the planet would be huffing and puffing and talking about child soldiers and how Gaddafi was forcing children to fire on civilian protesters. But because it is on the "Good" side it is just marketed as a cute photo. As I understand Misrata has been receiving a lot of reinforcements *cough* I mean humanitarian supplies from Benghazi. The Coalition navy sunk or beached a number of Libyan vessels that was trying to intercept these reinforcements *cough* I mean humanitarian supplies from reaching the port. Since then I understand that the flow of humantarian ammunition and fighters goes unhindered. Of course this doesn't mean that the 6000 migrant workers camping in the open air at the port guarded by the insurgents can be evacuated. I was kind of puzzled why, since we all seem so concerned about civilians, no one was lifting a finger to move them. I assume that the reason is that if they were allowed contact with the media they might tell some fairly horrific stories - not all of them totally complimentary towards the "Good Guys"
The Turkish ferry was a large ship - but supposedly only took off 250 wounded - mostly males of fighting age. As far as I can see, this is utterly irrelevant to the current topic. They're all so cute! That's Libya's future there, and I can feel the strains of that old Whitney Houston song building up to a crescendo! Edited by kmortis: Removed previously moderated content and response to same. FWIW, a nurse with Medecines sans frontiers nurse helped evacuate injured from Misurata just before this baby snipers report was filed. She mentioned some of the injuries that struck her most. Only two youth under 18 were mentioned, one with a head injury from falling off a truck, the other with severe facial burns from a molotov cocktail or some such. No bullet wounds that she mentioned. And of course, she's talking injured, not dead. So maybe the sniped tykes are real but have mostly died. Or were too seriously wounded to be moved? Even if so, we have many options for who's doing it. Gaddafi's been forced to extreme measures, like passing out one million machine guns to loyal citizens. His regime doesn't control the city. It anarchy, as I hear it. It's only natural to hold Gaddafi 100% accountable if just one of these citizens decided the green way is to kill the traitors; children and demoralize them. Better argument for regime change (following a hell of a lot more war), or for a cease fire? The former, of course, if this story turns out to be true or widely enough believed. If gaddafi does have snipers sitting around the city they must be getting pretty board so the odd kid getting shot isn't that unexpected. Here's a support finally for a young kid in Misurata shot with a bulet that nearly killed him. Government sniper? Other sniper? Crossfire? Last edited by Caustic Logic; 14th April 2011 at 03:15 PM. Sounds a bit odd. I suppose it might be possible that a child could be shot in the shoulder and his parents not be aware of it. But it is hardly the first thing a clinic does when a child comes and his parents say he is tired - whip him under the x-ray. Perhaps take his shirt of and see the bullet wound, which ought to be enough to convince most parents. Whether or not you take an x-ray when there is a clear exit wound I am not sure. 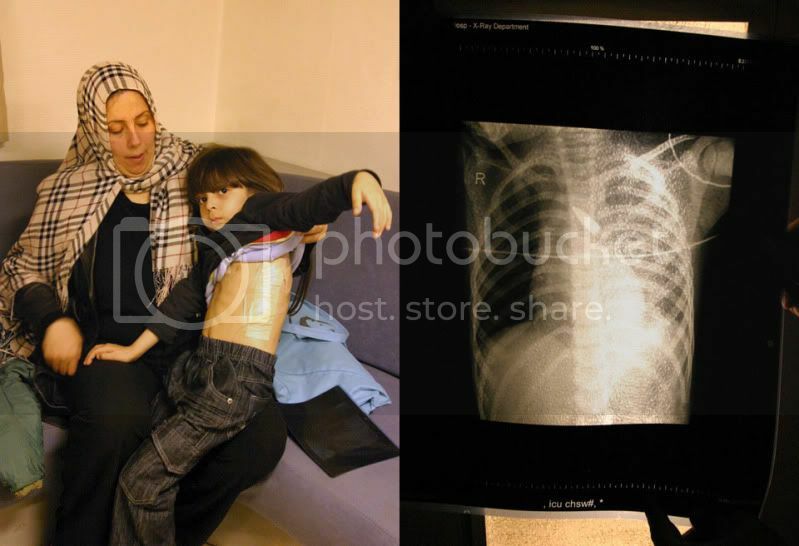 I have a suspicion that the X-ray that HRW was shown was an X-ray of a magic bullet and I suspect that not only did the bullet pass through the boy, but it also left a big metallic presence in the X-ray photograph. Magical things can happen during a war which the CIA and MI6 take an interest in a particular side and HRW and Amnesty turn up. As I understand, most civilians have evacuated out of Misrata to camps on the outskirts away from the conflict, but perhaps not everyone. Meanwhile the insurgents do a Fallujah-like defence, drilling holes in thick concrete walls of apartment buildings to make sniper positions almost impregnable to small arms fire. In a Misratah medical clinic lies one of Gaddafi's fighters. The 19-year-old was studying electrical engineering in Tripoli. As the fighting started and his lessons were stopped, he says he was forced to join Gaddafi's forces. "We were kept locked in the camp and trained for two weeks and then they took us to the battalion." Told that they would be fighting foreign mercenaries, they were brought to Misratah. When they came under heavy fire from the rebels, his officer turned and ran. The teenager followed, and was shot by his own brigade. translation: insurgent wounded during the conflict telling a transparently false story for reporters. Equally dubious are those "POWs" who suddenly realise they have been living in darkness the entire time and now want to fight Gaddafi. Quite likely genuine: stories of Libyan soldiers who shoot themselves rather than be captured by Jeffersonian democratic civilian protesters. Last edited by little grey rabbit; 14th April 2011 at 11:15 PM. Sounds kind of like a sniper shot, not unlike what happened to WPC Yvonne Fletcher. Entered the shoulder, hit the heart, lung, etc., and passed out her lower ribs. She just collapsed, little blood, and it took a moment for anyone to realize what had happened to her. There was no visible blood there, either. Gaddafi snipers, it was decided, in both cases. Women and children slaughtered, publics enraged, common threads. We have a precedent. 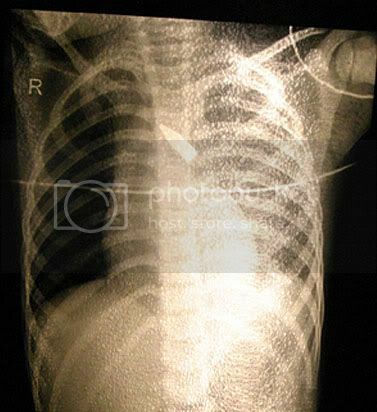 I suspect that not only did the bullet pass through the boy, but it also left a big metallic presence in the X-ray photograph. Good eye, LGR, but no. It's better (worse) than that. Now that I have a minute to look. I presume you refer to the line across the image. That would absolutely be wrong, I think (I did a Google image search, and only bullets show up, never their tracks) but I think that's something irrelevant. The bullet's still there! Right in the middle. The bullet is perfectly shaped, no apparent effect from entry. That might have something to with no sign of entry - not a single rib is of this delicate 5-year-old skeleton is disturbed. Tough kid! But the x-ray shows a bullet still there. It looks like a sniper bullet (? big and pointy ? ), fired from a low angle (unless the kid was doing cartwheels), NOT via his shoulder, and just stopping in the middle of him, halfway to his shoulder. In the picture his whole left side is bandaged, we presume wounded beneath. All I can say is I'm glad they're faking these things in Photoshop instead of actually shooting their own kids to leverage stronger support for regime change efforts. At the moment, I wish Gaddafi would just step down or whatever sometime soon so this absurdity can finally stop. Anyone else? How far off the rails have I gone here? Last edited by Caustic Logic; 15th April 2011 at 02:16 AM. What makes this story so transperently false? Show me the lateral view before I make any comment on that. Last edited by Rolfe; 15th April 2011 at 03:54 AM. Also note the photo. How long ago was this purported incident? March 19 to whatever, so about two, three weeks. Any signs of residual trauma you might see that soon after such a serious injury? Pallor, stiffness, swelling, i dunno. Kid looks healthy, limber, and comfy. X-ray shows why, I think. Not to argue with you, just I don't think we'll get other views (don't think they likely made more than the one), so we'll have to go with what's here. BTW: McHrozni thinks it looks fake. Last edited by Caustic Logic; 15th April 2011 at 04:02 AM. Contrary to what you might think of me, CL, I don't believe anything that simply agrees with my world view. As any human I am probably inclined to believe something that does more readily than something that doesn't, but that's as far as it goes. a. Just about all war stories are like this. b. It doesn't make any difference anyway, HRW are not deceived but are willing participants. Back in 2004 I checked up one of their atrocity reports in Koreme or Goreme Kurdistan. There were so many errors in their description of the village and there were some obvious signs of deceit - without going into details. I had wanted to go by myself but in the end was forced to go accompanied by the Mardin chief of police. At the end of the visit, he asked me several times worriedly "You are going to make a report to HRW?" I promised him I wouldn't, although I didn't say that the reason was that I doubted very much HRW had been fooled in the first place. The elites are raging out of control and all we can do is sit back and let them wreck as much mayhem and havoc, until they have been satiated for a little while. Maybe I should explain. An x-ray is a two-dimensional view. It shows you the position in the plane perpendicular to the direction of the x-ray beam. It does not show you the depth. Not at all. It is essential in a case like this to take both a dorso-ventral plate (shown) and a lateral plate (not shown) to determine where in the body that object is loged. That simply cannot be determined from a single view. A surgeon would look at both views, and examine the patient, and decide first where the object is, and second, how to remove it. The question of whether one actually wants to remove it at all will also come up of course. Do we know how the child was managed? Did they remove the bullet, and if so from where did they remove it? If they didn't, what were the clinical reasons for deciding to leave it in situ? I could certainly buy the idea that a child out playing was accidentally hit by a stray round, and the bullet lodged somewhere that looked spectacular on the x-ray, but in fact was not a huge clinical concern. I'd need a lot more information on the case though. I couldn't be sure these pictures are faked. I'd be a lot more likely to suspect someone putting their own spin on a set of circumstances that in fact bear only a tangential relationship to the scenario they are presenting. Well, that sounds like the right way to go about things in an ideal situation. But the key thing is, that bullet seems to be well inside his rib cage. And there's no door on that cage, just bones that I would imagine would be disturbed. It's also a very weird angle, and contradicts what his parent said about it entering at his shoulder. Another whole separate problem: yet another very young sniper victim in Misurata! “a small girl, no older than 4 years, who was targeted by a sniper’s bullet near the heart. But thank God, they removed the bullet, as you can see.” Bullet is shown in a vial. At 3:25 they show the x-ray from this girl, and I think it's the same exact image we're looking at here. This time, in a hospital setting, with the girl curled up on the bed under a blanket. I'm really not trying hard to find this much dirt. In fact, I've been very pressed for time. These people are just that transparent is all. Go team human rights! Destroy Gaddafi! Last edited by Caustic Logic; 15th April 2011 at 04:54 PM. Yes, I think it's the same x-ray. They don't let you get so clear a view of it, but just about everything I can see of it is in exactly the same position. You simply can't tell whether that bullet is in the rib cage or not. That's what I keep telling you. You get NO depth perception on an x-ray at all. Actually, come to think of it, it would be simplicity itself to fake the damn thing by getting the child to lie on the bullet, or to place it on top of her while the film was taken. Looking at the pictures, my guess would be on top. An expert radiologist might be able to tell by looking at the actual film. Of course you couldn't fake a pair of films like that, you'd never get the lateral view to line up. So it could be faked, far easier than using Photoshop, or if could be a real picture of a child with a bullet in a relatively superficial position. It could even be a picture of a dead child. It could be a genuine picture of either of these children. What it is not, is a picture of both of them. From a millitry POV the odd kid getting shot means nothing one way or the other. Misrata is meant to be something of a war zone kids do get shot in such areas. However from a millitry POV misrata makes no sense in general. The rebels can't fight. We've seen that. If the Vactican decided to invade libya the Swiss guard would be drinking tea in benghazi within 48 hours. That the rebels can hold Misrata is odd. Still perhaps the misrata rebels are better fighters than the benghazi mob. But then the casulty profile makes no sense. Gaddafi has some forces and the ability to bombard the city. The casulties should be massive. Hospitals shouldn't be slightly crowded but either flattened or full beyond overflowing. Kids shouldn't be playing in the street but hiding in cellers praying to whatever gods they belive in. Instead we have what? the odd person shot and a bit of bombarding of the harbour. It's possible that Gaddafi has only thrown a thin perimiter around the city and most of his forces are facing off against the benghazi mob but in that case why haven't the rebels been able to break out after we bombed the surrounding forces? I'll be honest, the first image in my mind was toddlers making last second EBAY bids.